And is it EVER! I don't even LIKE coconut and this is fabulous! I am not sure what possessed me to make this. Oh yes, I do, I had coconut milk and coconut in the cupboard. It ALMOST falls on me every time I open the cupboard, it was asking to be the star of a dish basically. I decided to go sweet. HOWEVER, just forget about that part, it just means you won't be able to eat as big of a piece. It is like a coconut cloud! I try and make desserts I don't like and won't eat. Does that make sense to anyone? Well I do, and it generally works. I did taste a bite of this cake. I liked it, ALOT. The coconut isn't in your face, fake coconut. The vanilla and white chocolate are subtle and the combination really works well. So I, the coconut hater, even likes this. Oh NO........my plan is RUINED! Preheat your oven to 350 degrees. In a small bowl mix, egg whites, coconut milk and vanilla together. Set aside. In your mixer bowl or a large bowl combine sugar, flour, baking powder and salt. 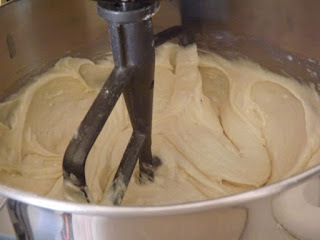 Use paddle attachment and mix for 1 minute until all dry ingredients are combined, add butter and mix again, until combined. Next, pour in the liquid ingredients you previously mixed together and mix until smooth and creamy! Butter or spray 2 8-9 inch round baking pans. Lay the bottom with parchment paper! Divide batter in half and fill both pans. Tap the pans on the counter to get any air bubbles out and back for 30 minutes. Check them at 25, but make sure not to over bake! When they are done, let cool for 5 minutes, run a knife around the edges and turn out onto a cooling rack. Let cool completely. In a medium saucepan bring butter, sugar, and milk to a boil. Stir constantly so it doesn't burn. As soon as it boils, add in white chocolate chips and vanilla. 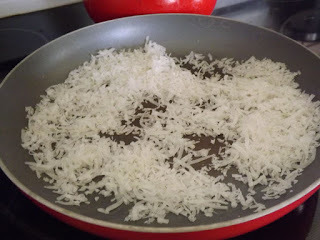 Stir a few times and then dump into your stand mixer or into a mixing bowl. You will need to mix this with your stand mixer or hand mixer until it is cooled and thickened. It took me over 10 minutes. No joke. I was sure at this point, this was never going to work but it does! When it is completely cooled, it will still be a little loose. Add powdered sugar and coconut and mix again. It is done! Frost your first layer, put the second on top and then frost the whole thing. 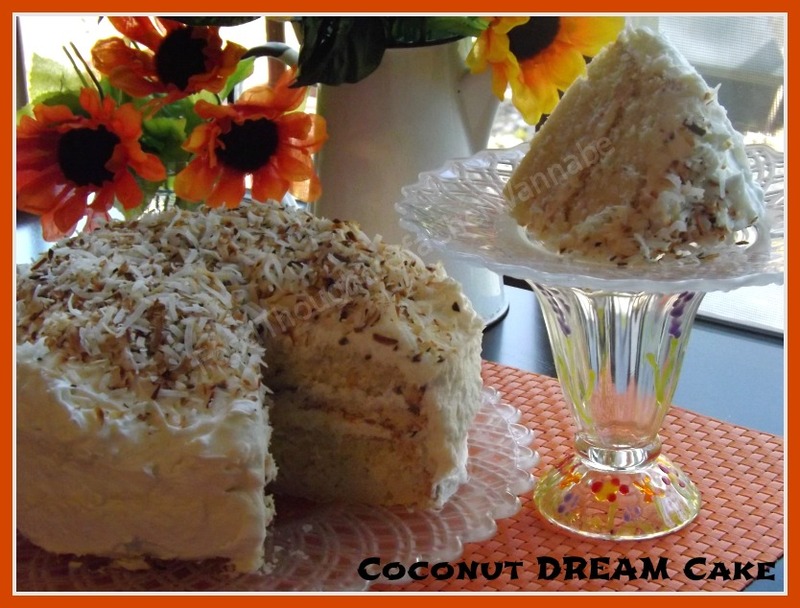 Sprinkle your toasted coconut on top! Now I warn you, you WILL have leftover icing. If you half the recipe, you risk not having enough. So the extra, I threw in a container in the freezer. Going to be great when I need some quick cupcakes! I don't like having not enough icing, so I did it this way and decided to just leave it. You can half it, but don't say I didn't warn you in case it isn't QUITE enough! Enjoy, and make sure to have some hot coffee or tea with this. It truly is a dream cake! I'm in love! I have to say that I think this is one of your best posts yet! And the best photograph to go with it! Congrats on this one. I will definitely be making this cake in the near future!!! Awesome, glad you like it! Thanks for stopping over! Hi Chris so nice to meet you. I bring all my cooking/baking to the office and the one time I brought some coconut cupcakes no one ate them. I don't know why people have such a aversion to cupcakes. I think they are tasty. I adore cupcakes, it feeds my germaphobe tendencies, and my portion control which I can't seem to control on my own. I don't like coconut so there was no worry on this one though! Thanks for stopping by! ahhh coconuts. you know what I meant. I never used to like coconut, but now it's one of my favorite things. This cake looks incredible. The frosting sounds so unique and yummy! Thanks Laura! It is DELICIOUS! The frosting was questionable for a minute but it is wonderful!! Thanks for reading! 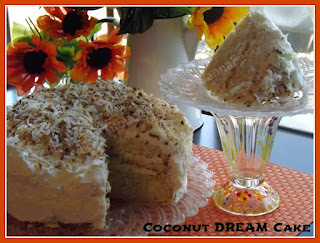 In the frosting, are you using canned coconut milk or the type you use from the refrigerator as a milk substitute?